Chef Matthew Raiford of The Farmer & The Larder visited from Georgia for last year’s Ark of Taste dinner. 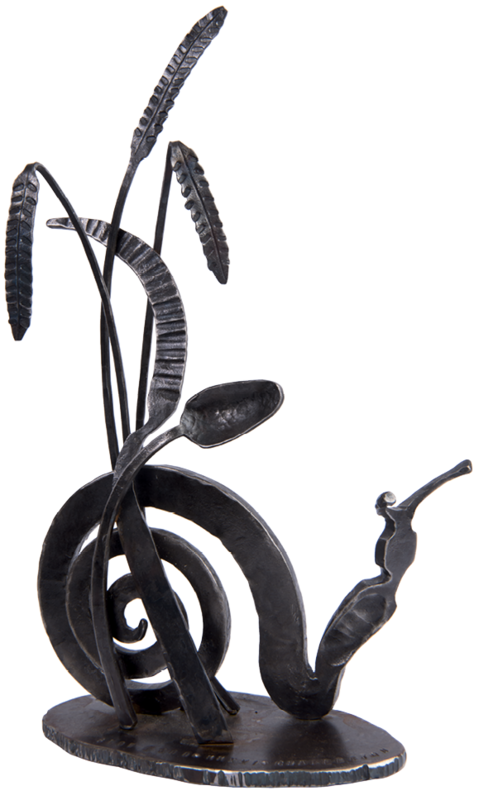 The Snail Award “Legend” honoree receives a locally forged trophy. Last fall, after spending four years coaxing mini lettuce, bulb fennel, and more from a one-acre plot at the Dirt Works Incubator Farm on John’s Island, Jim Martin of Compost in My Shoe made a huge leap, establishing his own operation eight miles down the road. For Martin, who sells his harvest primarily through CSA shares and to GrowFood Carolina, the transition has brought both excitement and challenges. Recognizing the latter, Slow Food Charleston—the local arm of an international nonprofit devoted to sustainable food practices—presented Martin with its inaugural SnailBlazer Micro-Grant in February. The $1,000 award will help the grower experiment with interesting pepper varieties—heirloom and otherwise—to identify those best-suited for his new farm. 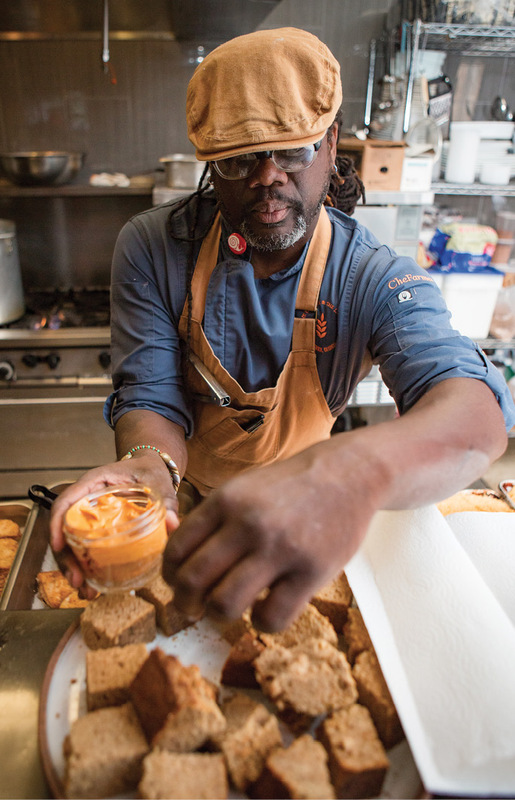 Martin’s prize is to be the first of many: “We’ll be offering $500 to $1,000 micro-grants on a rolling basis to help fund projects in the community that support the Slow Food mission,” says Slow Food Charleston co-chair Carolyn Larson. An alum of Husk and Green Grocer farm, Larson—whose husband, Jacques, helms the kitchens at Wild Olive and The Obstinate Daughter—runs the nonprofit along with Becky Burke, an area food advocate and lawyer who, when she’s not teaching hospitality law at the Culinary Institute of Charleston, heads up the Commune dinner series and slings oysters at The Ordinary. Since the local chapter’s founding in 2004, passionate foodies like Larson and Burke have populated the board, working to promote Slow Food International’s mission—“Good, clean, and fair food for all”—via events like the annual Ark of Taste dinner, which spotlights a rare ingredient in the hopes of promoting biodiversity and preserving foods at risk of extinction. For example, last year’s event featured Seashore Rye, a grain that Greg Johnsman of Geechie Boy Mill discovered growing in his backyard. Burke says the grain sprouts throughout the Southeast, but isn’t often utilized. “We feel it’s important to honor and preserve,” she adds, noting that chefs from all over the region joined in to highlight the rye in bread, pasta, beer, and whiskey. Other Slow Food events aim to educate community members about sustainable food practices. For example, the Tiny Tastemakers series pops up throughout the year at area farmers markets, where volunteers encourage pint-sized passersby to interact with local growers and sample healthful foods. The series has even evolved into a week-long summer camp. 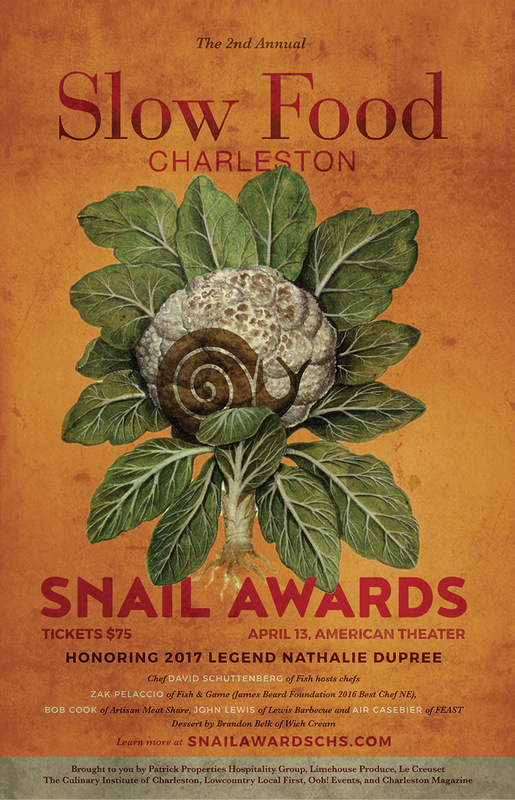 But perhaps the group’s buzziest event is the Snail Awards, slated for April 13 at the American Theater (visit www.snailawardschs.com for details). The annual ceremony celebrates the local growers, purveyors, and organizers whose work embodies the Slow Food philosophy. After the presentation, guests mingle amongst food stations manned by chefs such as John Lewis of Lewis Barbecue and Bob Cook of Artisan Meat Share. Who knows—maybe some of Martin’s yield will make its way onto partygoers’ plates. As Slow Food espouses, when it comes to our local food system, we are all connected.